As part of our coverage of the announcement of the Top Gear USA pilot, we've put together a special feature on each of the three co-hosts. First was Adam Carolla, then Tanner Foust and lastly, Eric Stromer. Meet Eric Stromer, recently announced member of our Top Gear USA host trio and lover of the Toyota Camry hybrid. He's certainly got a pretty face — looks made for TV, but who is this guy? 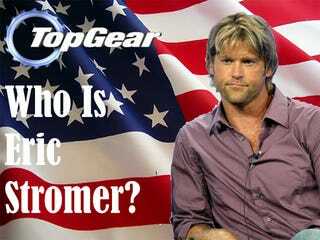 Does he have the chops to make it as a host on the American imported version of our beloved Top Gear franchise? Does he whiten his teeth? All fair questions. Well, aside from being a pretty face on TV, he's apparently handy with a hammer and saw. Stromer also has his own self-promoting Web site which conveniently gives us a raft of insight into the leather arm-band wearing, eco-friendly co-host. If you discount his time as a prop on "Santa Barbara," a show from the middle of 1980's daytime drama hell we'd watch only when the remote control was broken and we were home sick from school, and a couple stints on a few other TV shows, Eric has primarily been a construction guy. After 20 years running a construction company, the 47-year-old former People Magazine's "Sexiest Man Alive" was tapped for "Home Improvement with Eric Strommer," "Clean Sweep," and "Over Your Head," all produced for HGTV. When Eric isn't hosting stuff, he's apparently going to women's shows. Well, at least in 2006 he was. And he's working on a solo music project which has resulted in (bad) songs on his site that you can buy or sample-stream (if you can make it through them, you may be the progeny of Superman).